Anti Leprosy Day 2014 and Reach out program at Mangalore & Coimbatore. 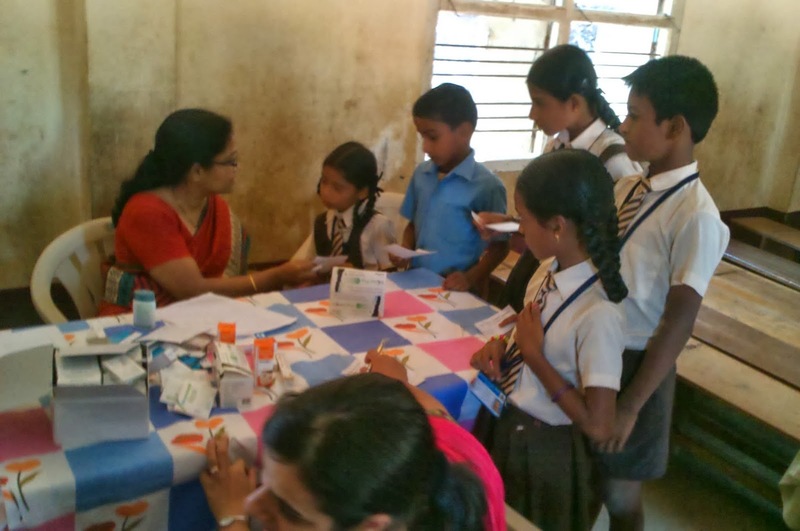 Indian Development Foundation (IDF) and St. Josephs Leprosy Hospital, Mangalore, Niligiris Leprosy Eradiciation Scheme organized free skin camp in Dakshina Kannada Zilla Panchayat Higher Primary School Thumbay Bantwal and Coimbatore. Rev. Fr. Rudolf D'sa- Administrator Fr. Muller Medical College, Sr. Aileen- Nursing Superintended Dr. Jacintha Martis- Prof. Dermatology Dept. and Dr. Kiran Shetty attended the program. About 500 students and teachers attended the program. Important information on Leprosy and other skin disease were given to them. Free skin camp were conducted for all the students, teachers and other surrounding people and free medicines, ointment were given by Fr. Mullers Hospital. The World Anti-Leprosy Day Reach out programme was jointly organized by Indian Development Foundation (I.D.F) and Coonoor Grace Charitable Trust (C.G.C.T) at St. John's Church Parish Hall on 29th Jan, 2014. The programme started off with a Prayer Song by Mrs. Bullmore’s Mat. 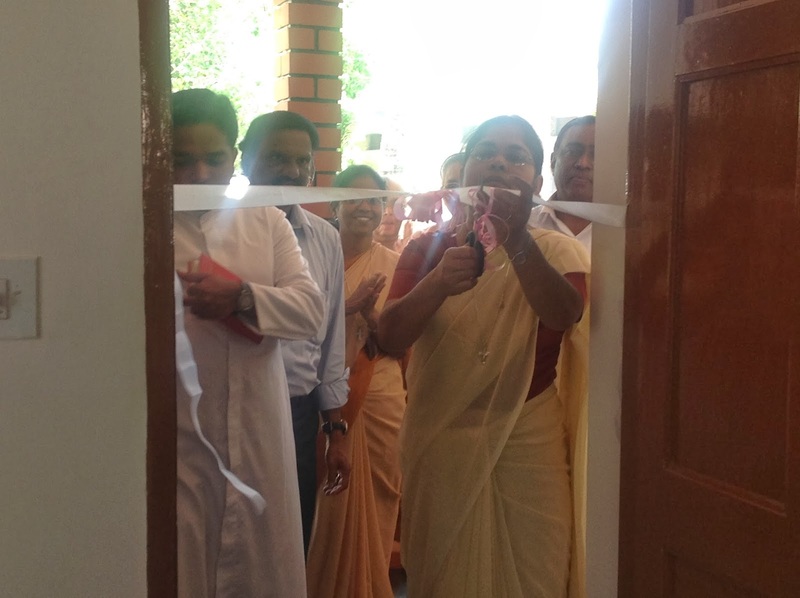 School, Coonoor followed by the lighting of the lamp by the Guests and a Prayer by Rev. Arul Raj of St. John’s Church, Coonoor. Mr. D. Mano Ranjit Lad, D.E. 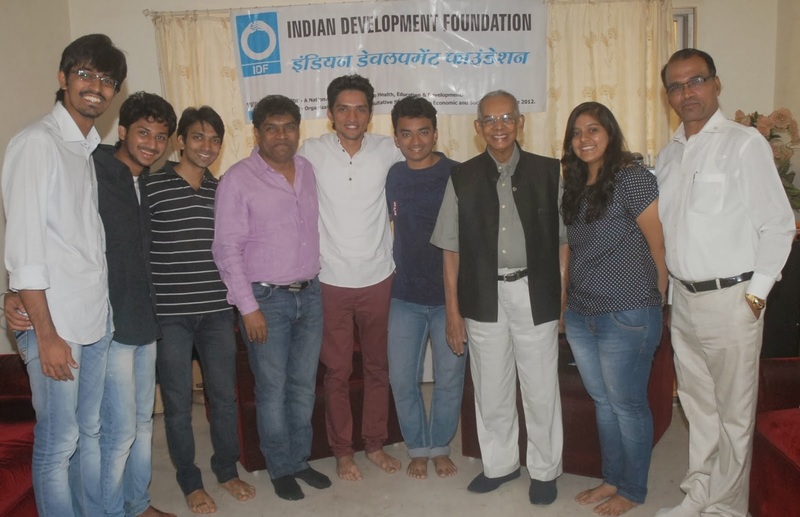 of Indian Development Foundation, spoke on the Vision and Mission of I.D.F. Later, Rev. Fr. Leon Prabhakaran, Parish Priest of Sagayamatha Church, Coonoor addressed, while speaking on this occasion he said that both I.D.F. and C.G.C.T. have done a wonderful job helping the sick and the needy. He also said that mankind is manhandling human beings, such programmes will help us to think about our own way of life. He also quoted about the service of Mother Teresa to the poor and the needy. He concluded the session by appreciating the good work by both the N.G.Os. Dr. K. Srinivasan Pothi, Medical Officer, FPAI, Nilgiris Branch spoke on the occasion and said that both the N.G.Os have taken good efforts in organizing the program, he also appreciated the good work and gave a detailed note about their work in Nilgiris. The Chief Guest, Mr. K. Laxmanan, District Educational Officer addressed the gathering, while speaking he said that both the N.G.Os have set a good example for one and all to serve the sick and the needy people. Since the students were also present, he encouraged them saying that, you may have several skills, to become a Doctor, Engineer, Teacher, etc., but you should remember, above all this, you should never forget to love your neighbor and serve the mankind. Speaking on this occasion, Mr. Laxmanan also said he was overwhelmed with joy in participating in such programmes. 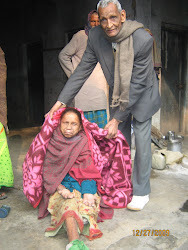 Later the guests distributed blankets and gifts like towel, plate, glass, soap and biscuits for more than 100 poor Leprosy/AIDS, TB and physically challenged patients. Lunch was sponsored by Mr. Ram from Coonoor for all the patients. Earlier, Mr. D. Mano Ranjit Lad, D.E., I.D.F. welcomed the gathering and Mr. Gibson C.G.C.T. proposed the vote of thanks. The function concluded with at National Anthem by the students of Mrs. Bullmore’s Mat. School, Coonoor. In the afternoon, there was health camp for the Leprosy patients, at Y.M.C.A. hall, Coonoor, during which medicines and M.C.R. chappals were also distributed to them. King of comedy appreciates national leprosy work of IDF on the eve of Anti-leprosy day. King of comedy Johny Lever appreciated the leprosy eradication work of Dr. ARK Pillai spanning 45 years. Dr. Pillai is an icon of inspiration who along with various social organizations and volunteers have been working hard towards achieving the vision of Mahatma Gandhi - a leprosy-free India. Johny Lever called on Dr. Pillai and team IDF on the eve of Anti-Leprosy Day and commended the humanitarian work carried out by Indian Development Foundation (formerly Indian Leprosy Foundation). Life provides wonderful opportunity to spread happiness and see that people around are healthy and happy. Johny Lever was addressing a group of volunteers motivating them with his personal life-story and the journey of life which is full of giving and sharing joy. 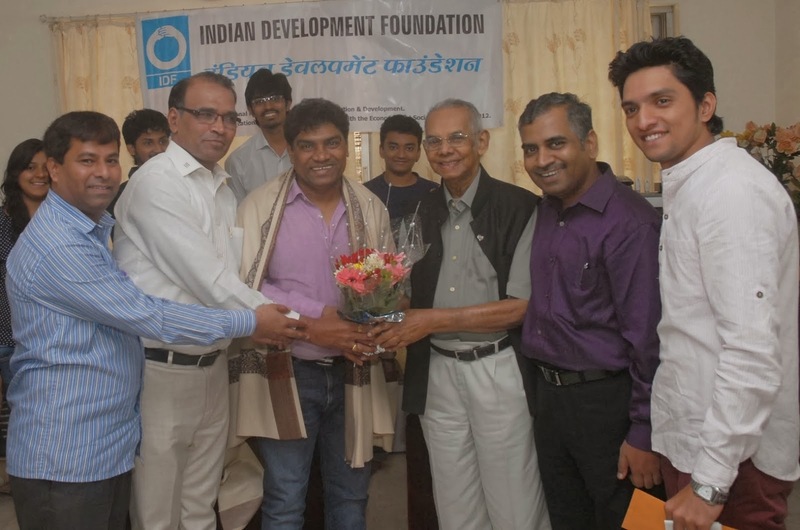 Being associated with various social organizations, Johny Lever could connect the social chord and left an indelible social impact in the young minds. Indian Development Foundation (IDF) inaugurates Women Empowerment Programme at Karnataka with good participation from prospective students. Sr. Sandhya, the Provincial of Notradame Convent, Vice Provincial, Sr. Krupa, the Principal of Sophia High School, Sr. Rosilin along with many other Sisters took part in the event, appreciated IDF's role in nation's development and wished the program all the best. Mr. AG Prakash, Princiapl of Sri Ayyappan High School, Jayamahal took part as the Guest of Honor and appreciated the women who had registered for the computer training program. He said modern world demands the people to have computer knowledge. He appreciated Sr. Reeta, the coordinator of the Program for her initiatives in empowering the rural women. 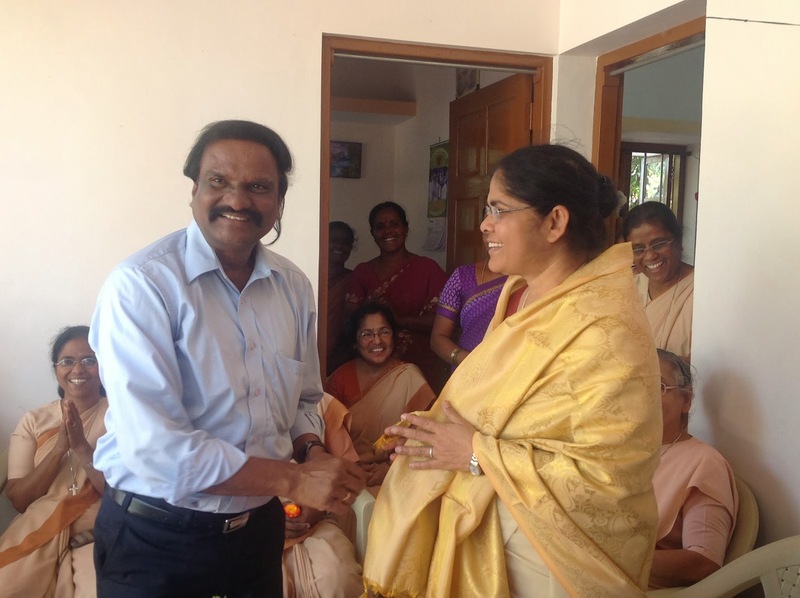 Sr. Sandhya was the Chief Guest for the function. He cut the ribbon and opened the Computer Training Centre. Sr. Rosilin and Dr. Franklin also spoke on the occasion. Earlier, Br. Martin, Blessed the computer centre. 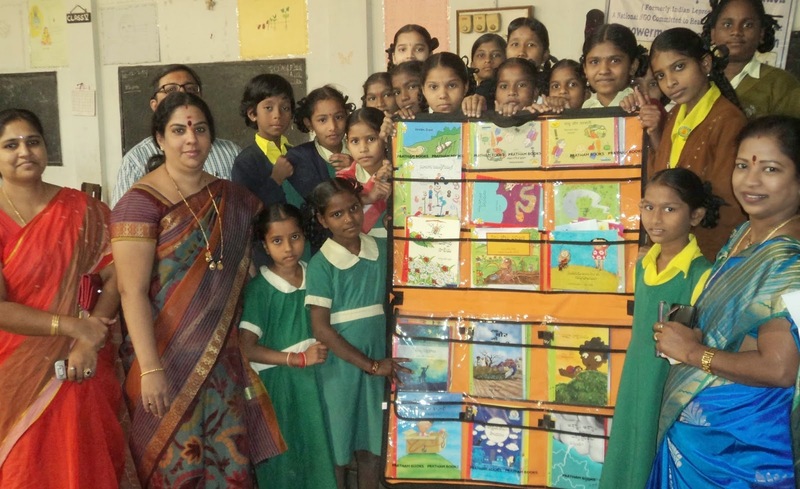 Indian Development Foundation (IDF) in association with Pratham distributed Books- Library in Classroom (kits) to the schools in Andhra Pradesh. Students and teachers were very happy to receive those books and appreciated the samaritan efforts. IDF partners with ICFAI for Centre for Women Development, Hyderabad. With an intention to bring about the advancement of women in three communities - rural, students and the employed the ICFAI Foundation for Higher Education inaugurated "The Centre for Women Development (CWD)" at its campus. 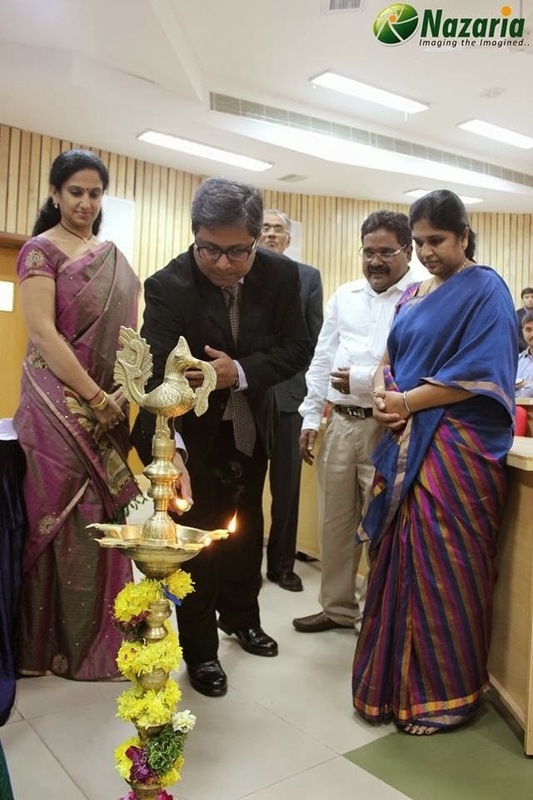 C Suvarna, Special Commissioner (Watersheds), Government of Andhra Pradesh, who inaugurated the centre said that policies have theri own limitations and beyond that it is the initiatives by institutions like ICFAI that can educate, create awareness ad empower women across all strata of the country. Guests of honour Vanitha Datla, Managing Director at Elico Healthcare Services and Sanjay Ram, Project Coordiantor of Indian Development Foundation, enlightened the audience J. Mahender Reddy, Vice - Chancellor of IFHE spoke. 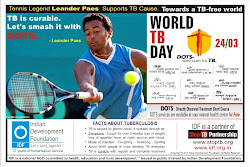 Indian Development Foundation (IDF) conducted T.B. & Leprosy awareness lecture for the schools in Goa; St. Rock's High School, TollecantoBethany High School, Sau Jose De Areal, and at KV Bambolim. Loss of Appetite & Body weight. 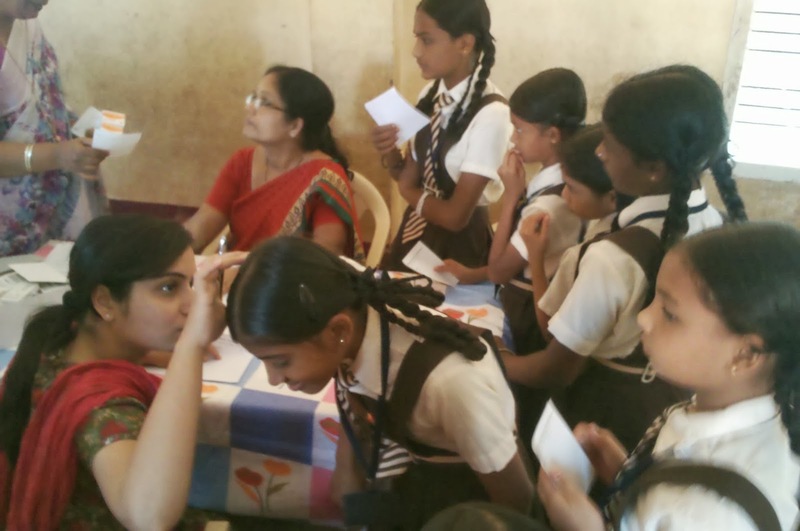 The students were made aware regarding the prevention and symptoms of disease TB, Leprosy et al. The principal asked the students to make most use of the awareness and spread the information in the society. The session was an interactive were many students asked their questions. IDF appreciates the efforts of the school authorities for arranging one such lecture. Special thanks to Mr. Thomaskutty & Mr. Mario Quadros for their samaritan efforts. Bharatiya Vidya Bhavan's Bhavan Vidyalaya, Chandigarh extended support to IDF's health, education and development projects. Mrs. Vineeta Arora, Principal of the school and students were honoured with IDF Excellence Award for their continuous social support to various humanitarian projects. Dr. Narayan B. Iyer and Mr. Kovid Oli addressed the students and appreciated the role of students in social welfare projects. Team IDF visited the school on 20th of Jan. 2014 and did the honours. IDF salutes Bhavan Vidyalaya for their constant support. also danced on the tunes. The students also played a game of Housie with the grannies. The winners of the game were given cards & biscuits. Students also distributed cake, biscuits, key chains etc. The students also distributed other items viz; toothpaste, tooth brush, soaps, etc which was donated at the center. IDF appreciates and thanks Vibgyor High, Students, Teachers (Ms. Pooja & Ms. Sudha) and staff for making arrangements for the visit. Special thanks to Sister Janet and the entire staff of Assisi Bhavan. Grade 3 & 4 students from Podar International School, Santacruz (W), Mumbai invited a group students from St. Catherine's School, Andheri (W), Mumbai for celebrating Kite Flying Festival (Makar Sankranti) on 13-01-2014. 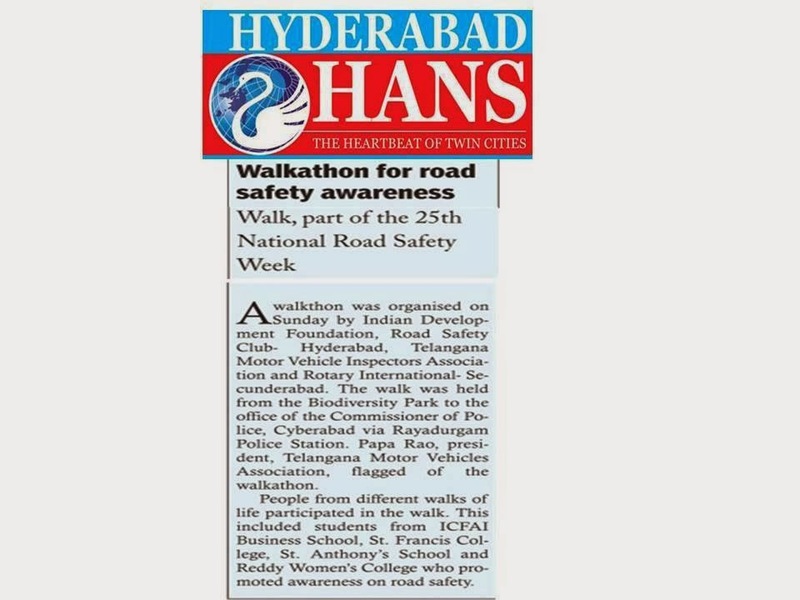 Walkathon - 25th National Road Safety Week, Hyderabad. WALKTHON was organised on 12th Jan 2014 at 7AM by Indian Development Foundation, Road Safety Club Hyderabad, Telangana Motor Vehilce Inspectors Association and Rotary International Secunderabad Silverline from Biodiversity park to office of the commissioner of police, cyberabad via rayadurgam police station. Mr.Papa Rao, President, Telangana Motor Vehicle Inspectors Association and Dr. Dinesh Director Rainbow Hospitals flagged of the “Walkathon”. Indian Development Foundation team and IDF Social Ambassadors, Telangana Motor Vehicle Inspector association members, Road Safety Club members, Rotary International Secunderabad Silverline members, Greater Hyderabad Activity Club members, ICFAI Business School Sankalp Club students, Students from St. Francis College, St. Anthonys School, Reddy Womens College, People from Corporates participated. There is a need for the society at large to take cognizance of Road Safety and to join hands to make road safety a social movement.The challenge now for all of us is to change the "mindset " of the public to be more responsible whilst on the roads. 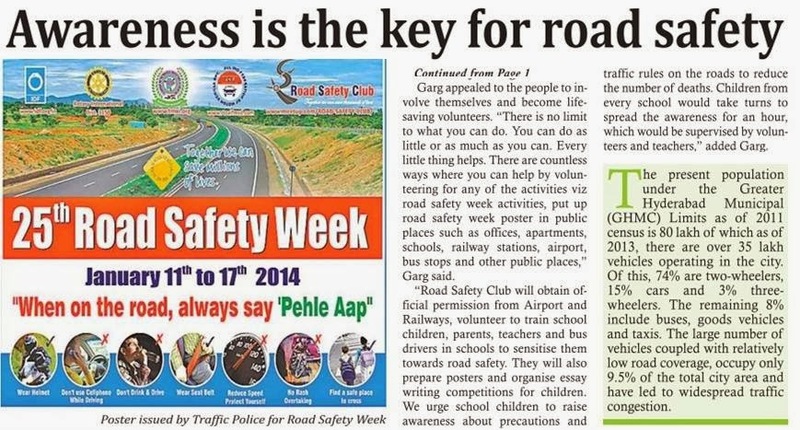 The theme for the week will be when you are on the roads "PEHELE AAP"
IDF National Road Safety Week, Hyderabad. 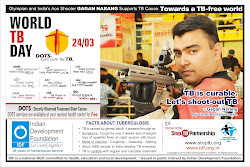 Indian Development Foundation (IDF) conducted T. B. Awareness Program at Alpha Matriculation School, Semmbakkam, Chennai. IDF appreciates the continued support of Alpha Matriculation School. Inauguration of 25th National Road Safety Week, Hyderabad. 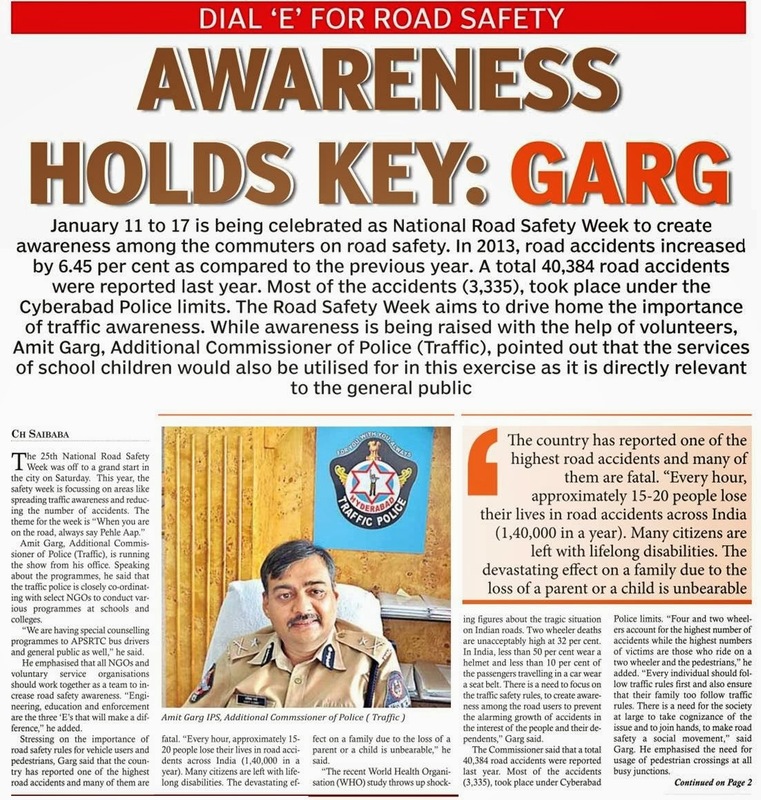 The 25th National Road safety week was inaugurated on 10th Jan 2014 by the Transport Commissioner by Shri Amit Garg ji, IPS, Additional Commissioner of Police (Traffic), Hyderabad. The event was kick started by Shri Amit Garg Ji from KV Picket and various activities are being conducted in schools across Andhra Pradesh from 11th Jan 2014 and will be conducted till 25th Jan 2014. He emphasized that all concerned should work together as a team together to increase road safety awareness and said that Engineering, Education and Enforcement were the three ‘E’s that would make a difference. He stressed on important road safety rules for vehicle users and pedestrians. Shri Amit Garg ji made all students and people present in the function take a pledge to follow traffic rules and also ensure others do not violate any. 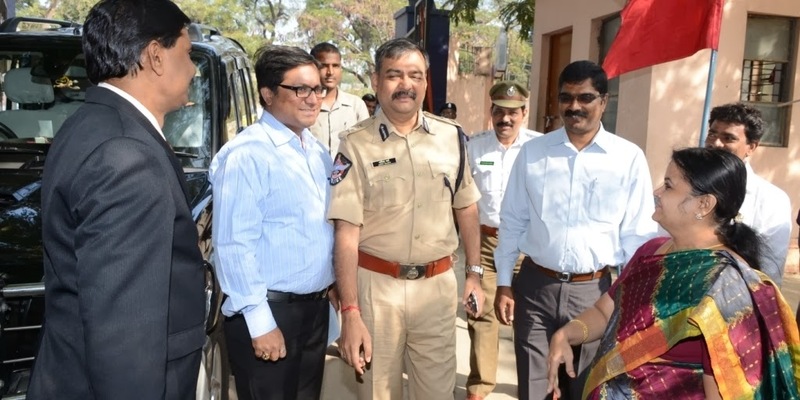 He appreciated the initiatives taken by the organizers of the event Indian Development Foundation, Road Safety Club Hyderabad, Telangana Motor Vehicles Inspectors Association and Rotary International Secunderabad Silverline on creating road safety awareness for school children. 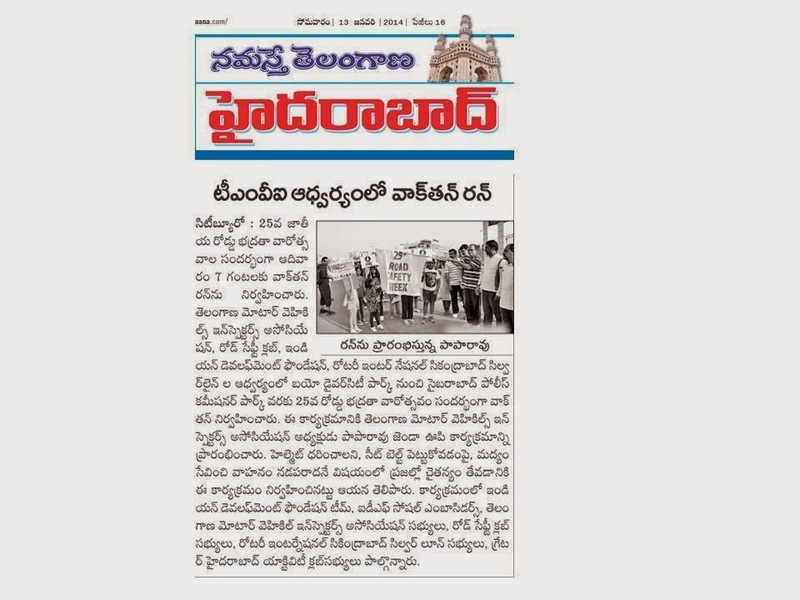 Prior to the start of the inauguration Dr. P. Sreenivas, Road Safety Organiser and Secretary Telangana Motor Vehicle Inspectors Association gave a presentation to children on various aspects on Road Safety. Mr. Srinivas emphasised the road safety aspects for children and how they can be more careful on roads. The presentation was well appreciated by one and all. 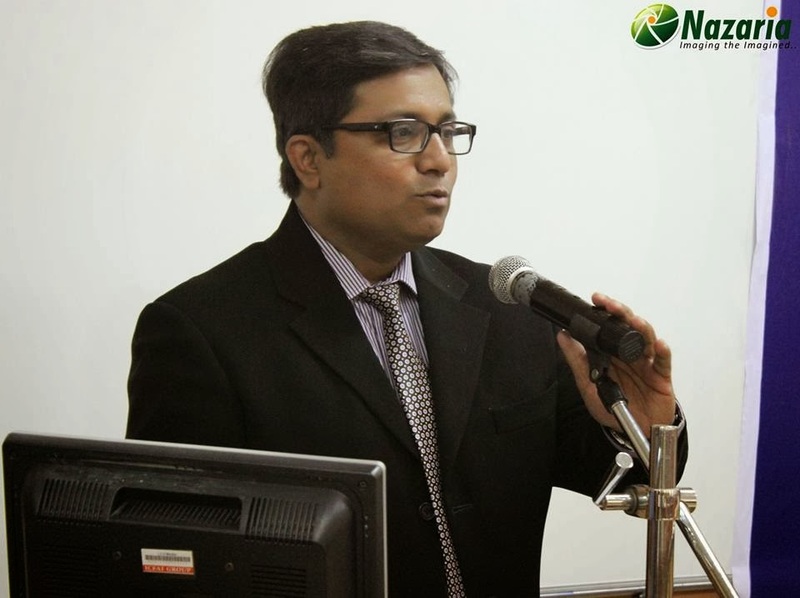 Earlier Mr. Sanjay Ram, Project Co-ordinator of Indian Development Foundation welcomed and introduced the guests. Mr. Sanjay Ram said that in Hyderabad on an average 200 accidents take place every month. Highest number of accidents are done by 4 and 2 wheelers and highest number of victims vehicles are 2 wheelers and “PEDESTRIANS” !! There is a need for the society at large to take cognizance of the issue and to join hands to make road safety a social movement. 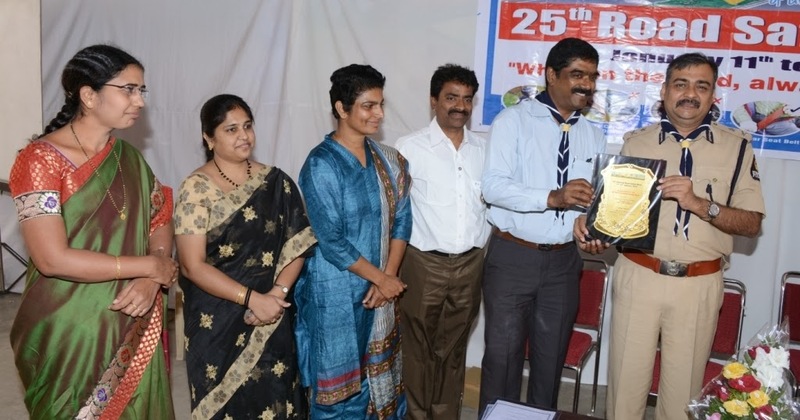 Shri S. Sambanna, Assistant Commissioner Kendriya Vidyalaya Sangathan, Hyderabad was the Guest of Honour. He expressed concern over the increasing number of accidents. He emphasized that awareness on road traffic safety was a need of the hour. Mrs.V Gowri, Principal Kendriya Vidyalaya Picket was the special Guest at the function. She emphasized on the need for more pedestrian crossings and also a control on rash driving by youngsters. Creating road safety awareness in children is essential for the future. While Dr. Geetanjali Ramachandran, Road Safety Co organiser and IDF Social Ambassador proposed a vote of thanks. Mrs. Padmaja teacher K V Picket IDF compered at the function. Students of Kendriya Vidyalaya Picket Secunderabad set the tone for the event with a soulful invocation. People from all walks of life attended the well-organized function. Indian Development Foundation social ambassadors Mrs. Swati, Mrs. Rama, Dr. Nikhil, Dr. Sravan, Mr. Venkateshwar Rao, Mr. Ramesh, ICFAI Business school, Sankalp club represented by Mr. Vipin , Ms. Shivani and their group, Yash Technologies represented by Mr. Purnachander Rao and Mrs. Hema, Road Safety Club represented by Dr. Geetanjali, Mr. Shekar , Mr. Manideep, Rotary International represented by Mr.Vishnu Jagati and his team, Mr. Santosh from St. Johns Ambulance Association, print and electronic media, police personnel, parents of children of K V School and many more. We would like to thank Hyderabad Traffic Police personnel / IDF social ambassadors / friends / well wishers / Co organisers / K V Sangathan / principal, teachers, Staff and children of K V picket, and media for their excellent support and encouragement. IDF conducts HAP at St. Philomena School, Bangalore. Indian Development Foundation (IDF) conducted Health Awareness Program (HAP) & TB awareness Program at St. Philomena's School, Bangalore. The Programme was conducted by Mr. Arulraj and other IDF members. Approximately 200 students and few teachers were present. Indian Development Foundation (IDF) organized a student sensitization programme for the students of Vibgyor High, Goregaon, Mumbai on 7th Jan 2014 at St. Catherines' Home, Andheri. Students from 6th & 7th Grade formed the part of the program. The students collected lot of items viz; toothpaste, tooth brush, soaps, biscuits, chips etc which was donated to the center. The students from Vibgyor high played Housie (Housie is a game of probability in which players mark off numbers on cards as the numbers are drawn randomly by a caller, the winner being the first person to mark off all their numbers). The winners of the game were given respective prizes. The Students also mobilized various stationary items viz; book, comics, pencil, pen, colors, toys etc. which were distributed to the students later. The students were very happy as they received the gifts from the Vibgyor students. The Students were then taken on a visit to the centre were they experienced the greenery around the centre and the beautiful set up of the campus. Sister Fathima guided the students while taking them for a round in the centre. 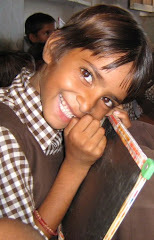 Students visited the primary school, children (orphan) center, Snehaanjali (HIV centre) and the homes. IDF appreciates and thanks Vibgyor High, teachers and staff for making arrangements for the visit. Special thanks to sister Loretta and the entire home staff. 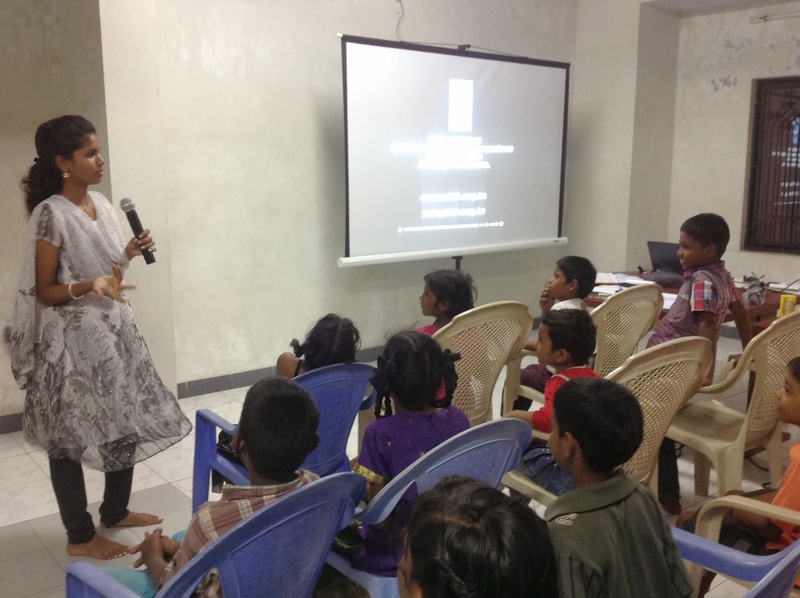 Indian Development Foundation (IDF) conducts an audio visual program for the students of Kalam Bal Gurukul. IDF Social Ambassador Karan Dravid Spoke with the students about his experience and activities of IDF and how students ca contribute to the development of the society and country. Face the Interview by IDF Social Ambassador Mr. Kiran Naik. 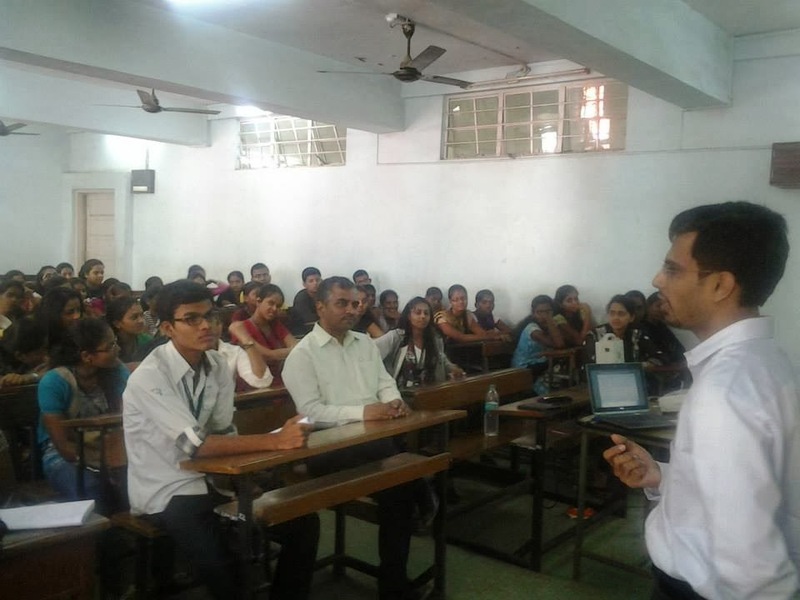 The students of VIVEK COLLEGE OF COMMERCE, GOREGAON, Mumbai got to learn the essential tips of interview when Mr.Kiran Naik, Consulting Practice Manager at Oracle Financial Services and social ambassador of IDF took the lead to launch the session on `How to face an Interview' on 6th Jan. 2014. The session was well received by the students. "There are placement agencies coming to our college and for many freshers it is a nightmare to face an interview, such valuable sessions will help students to overcome fear of an interview and face it with confidence", expressed Satendra Prasad Gupta, College NSS Unit Secretary. Mr. Kiran Naik conducted a mock interview involving a volunteers. He went ahead in explaining the job opportunities and the expectations with regard to employers point of view. 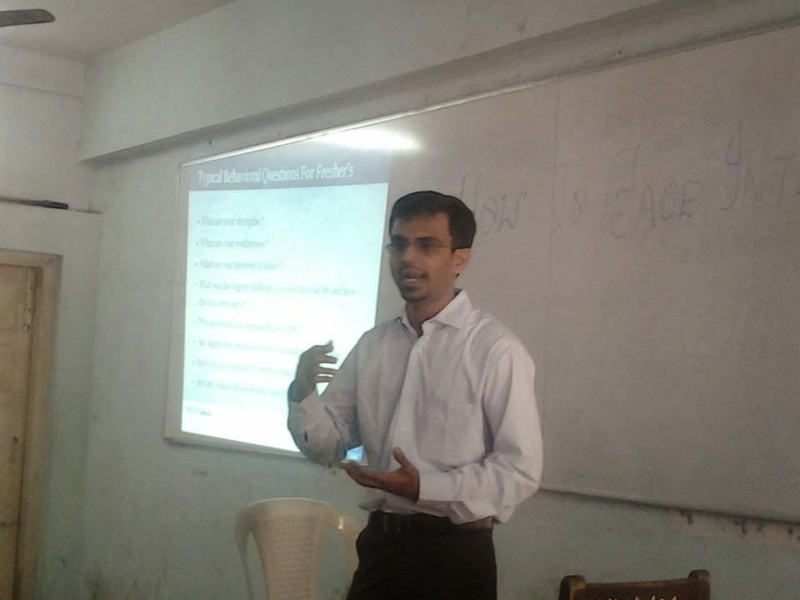 He also touched upon typical behavioural questions that are asked in an interview which helped the freshers. Valuable tips on presentation and emotional intelligence were the highlights of the session. CA Sachita Trivedi, IDF Social Ambassador also spoke on the occasion highlighting the need to be calm and composed in an interview. Dr. Narayan Iyer, CEO, IDF said the session was organized as part of IDF Centre of Excellence's motivational session. Dr. Nandita Roy, Principal of the College and Dr. Suresh Nair, Principal of Vivek Vidyalaya & Junior College appreciated the efforts of IDF in organizing such useful sessions. 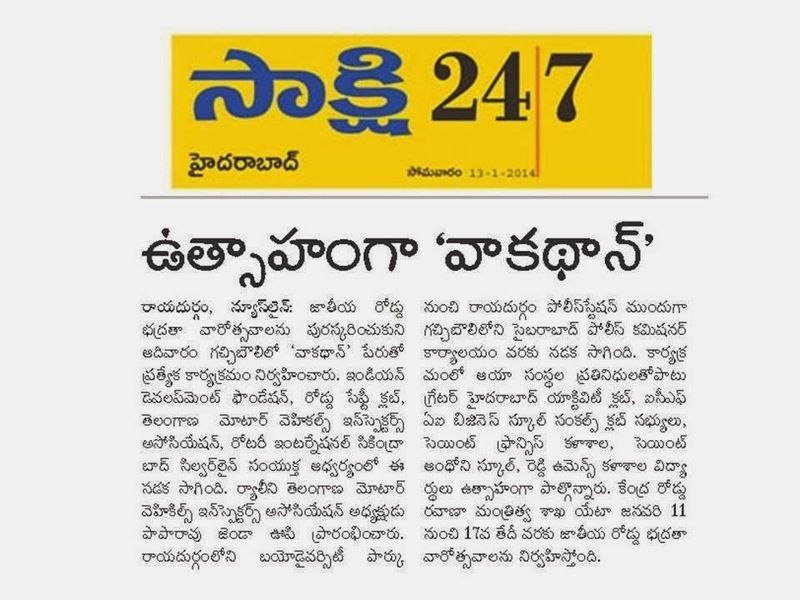 Secunderabad Public School student sensitization program. 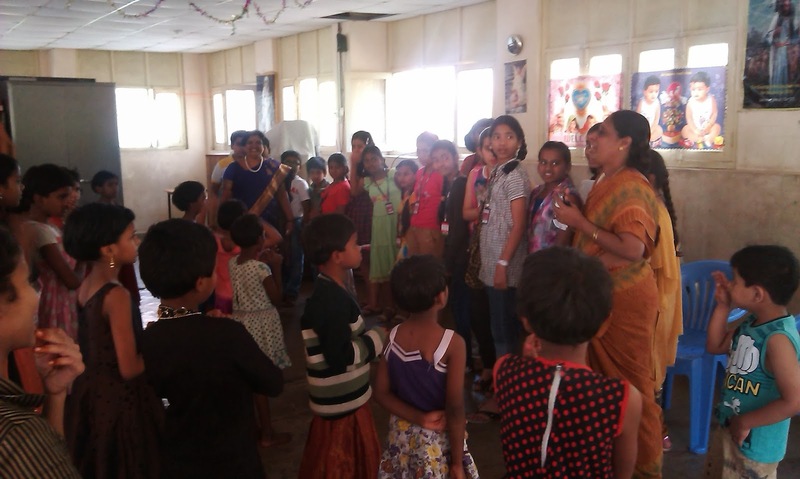 Indian Development Foundation (IDF) organized student sensitization programme for the students of Secunderabad public school on 5th Jan 2014 under the " IDF Mutti Bhar Chaval Programme". The students mobilized lot of grocery items - rice, dal, oil, soaps, pastes, brushes, biscuits, chocolates, comics etc under the " Mutti Bhar Chaval" programme. 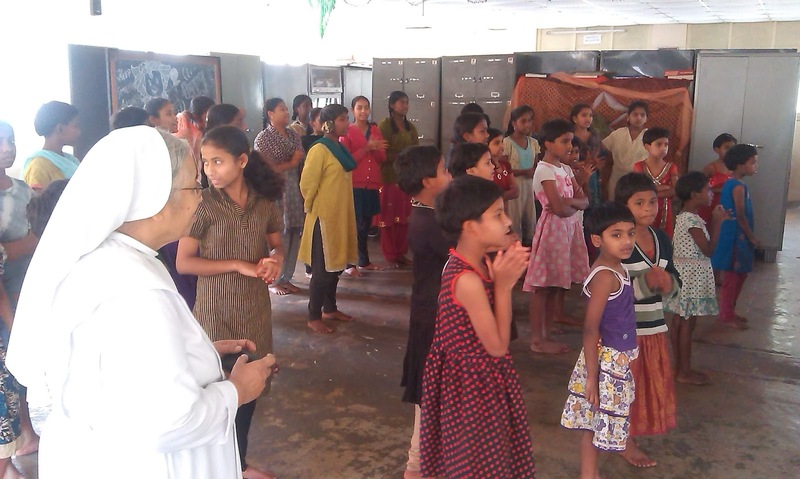 The students were taken to Auxilium Navajeevana Salesian Sisters, A home for street girl children and young girls at risk, Secunderabad. Sr, Crocetta, Superior spoke to children on the for Joy of giving and leading a disciplined life.Two teachers and one child parent Mr. Sastry - Finance manager from D.Q entertainments accompanied them. They interacted, danced and played with the children of the home and presented all the items to them. It was a wonderful experience for all children from SPS and also for children from Auxilium. IDF apprecites the efforts of associates. 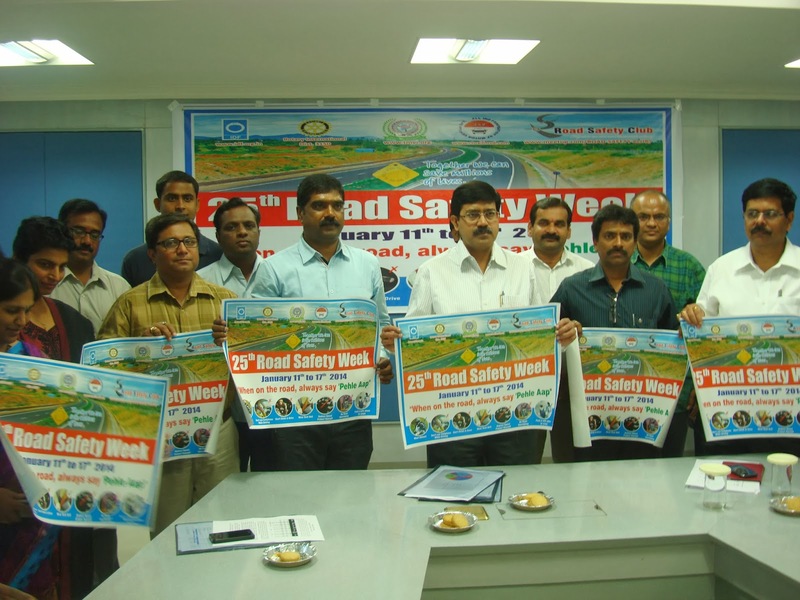 The 25th National Road safety week poster was inaugurated on 4th Jan 2014 by the Transport Commissioner Mr. Ananth Ram, Mr.P.Srinivas Additional Transport Commissioner, Mr.B.Venkateshwarulu Joint Transport Commissioner and Mr.G.Panduranga Rao Joint Transport Commissioner. 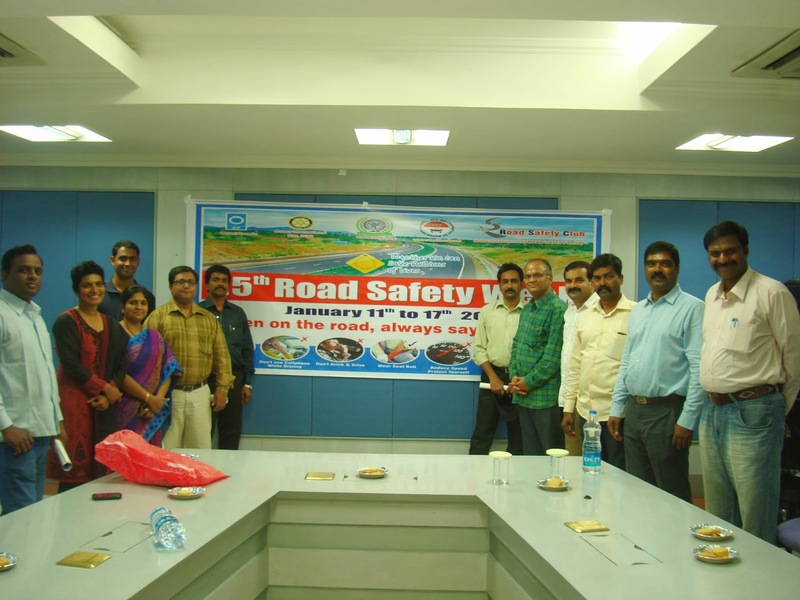 The Road Safety Week (RSW) activities are planned and coordinated by IDF team, Telangana motor vehicles association, Rotary International Dist. 3150, Road safety Club , Hyderabad. Road safety club and TMVI was represented by IDF Social Ambassadors Dr. Srinivas, Motor vehicles inspector, Dr. Geetanjali and Mr. Shekar. Indian Development Foundation (IDF) team was represented by - Mr. Sanjay Ram and Social Ambassadors - Mrs.Rama , Mr. Ramesh, Mr. Madhukar and Mr. Venkateshwar Rao. Rotary International Dist. 3150 was represented by Mr.Vishnu Jagati , Immediate Past President (IPP), Youth Activities. Speaking on the occasion Mr. Ananth Ram emphasized the need to create awareness not only during the week but throughout the year. He congratulated the IDF for their efforts in taking up the awareness programs in Schools and Colleges. 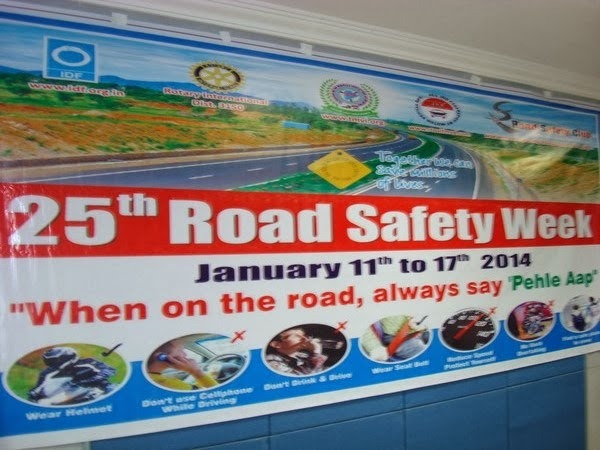 Volunteers from Road safety club members, Rotary Internationals youth wing, students from engineering colleges, IDF social ambassadors would meet different schools/ colleges/ corporates/ business establishments etc and hand over the posters for display, plan activities and implement.